Belgium, perhaps Bruges, ca. 1465. 19th-century dark brown blind-tooled morocco. 251 leaves (1 column, 15 lines), bound : vellum, ill. ; 100 x 70 mm. Arthur H. Raynolds (bookplate on inside front cover); E. Clark Stillman Collection. 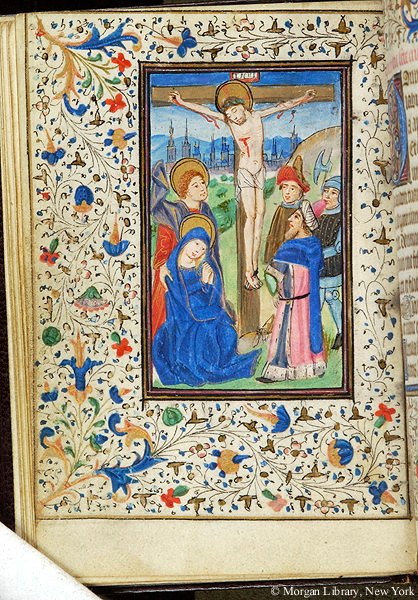 Ms. book of hours, use of Rome (Hours of the Virgin, Office of the Dead); written and illuminated in Belgium, perhaps Bruges, ca. 1465. S.6 has the nickname "Sony Hours" because Stillman used to keep it in an old Sony portable radio case. Decoration: 14 full-page miniatures with full illuminated borders, 14 facing full illuminated borders.